We have 6 – count ’em, SIX! – free promo codes to give away for the newest version of the awesome Twitter – and now Facebook & E-mail – Push Notifications App, Boxcar 2.0! We have the pleasure of offering six promo codes for the excellent app Boxcar 2.0, which pushes notifications for Twitter updates and Facebook updates, as well as select emails when forwarded to a special boxcar.io email account. 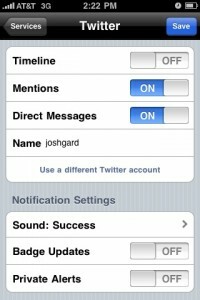 Notifications can have a customized sound effect, as well as open the app of choice upon viewing the alert (ie. Facebook alerts can open the Facebook app, Twitter alerts can open Twitterrific, etc…). More details about Boxcar 2.0 can be found on my earlier review of this app, here, or visit Boxcar’s website here. Contest winners will receive one promo code, to be redeemed for the Boxcar 2.0 app in the US iPhone App Store, which also includes the use of one notification service (Twitter alerts or Facebook alerts or e-mail alerts). Additional services can be added via in-app purchase. Read on for details about how to enter the contest! ** Just add a comment to this post, including your e-mail address (don ‘t worry, it won ‘t be displayed and we won ‘t use it for any other reason than to contact you if you win) “ and you ‘re in with an entry for our random drawing of winners this coming Saturday. That ‘s it. We ‘ll draw our six (6) winners on Saturday (10/10/2009) sometime after 3:00pm US Pacific Time, with the winners being announced shortly thereafter. Winners will be announced on the website, as well as contacted by email, so be paying attention! Note: Promo codes being given away require a US-based iTunes account to redeem and must be used within a limited timeframe. Keep this in mind when entering the contest. Interesting, would definitely be a useful app. I wonder, does the promo code works for non-US iTunes? It's cheaper than Mobile Me! Keep in mind this isn't pushing the emails themselves, just a notification alert, popup, and/or sound. Boxcar provides no mail functionality in itself, the email is still received via the Mail app at whatever interval you have set. I'm using GPush, but Boxcar intrigues me. I saw this from your tweet! Sounds great! This allows the dev to sell the app at the low price point as the original Boxcar, which was Twitter push only, as well as be able to offer additional services to those users who desire them, without forcing everyone to purchase a higher-priced app when perhaps they don't need the additional functionality. IMO, this a an excellent way to utilize in-app purchases. Just to clarify, Boxcar 2.0 *is* a free upgrade for existing owners. If you've purchased Boxcar 1.x, then you upgrade to the base version of Boxcar 2.0 at no charge. That allows you to maintain the same level of functionality, with the option of then adding additional services (fb, email, Twitter searches, etc). I would love to be in the running! Facebook push is awesome! I'm using Pushmail but would give this a try! Looks great! Would love to try it out and become a promoter. Oh yeah, put me in the running too!!! I use Gpush but I would love to try Boxcar! I would love to try Boxcar! After not being able to get Google Push email to work perfectly I am looking for an alternative. Also, my tweetie app doesn't have push so doing twitter push would be great as well. Would love a copy, thanks as always for the site and for the contest! Looks nice. I would love to try it. Boxcar looks great. I'm currently using gPush but would like some more push alerts. I'm a huge fan of using facebook and twitter. 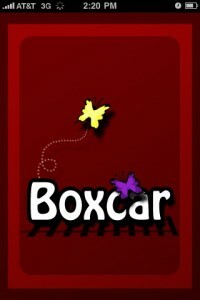 I'v been reading about boxcar, but never have had the chance to try it out. it would be great to get a chance to win, so that I might never have to turn on my phone and launch facebook and twitter all the time, just to see whats new. "Push, for the world!" like to get one code. Yey i want to try push notifications!!! count me in !!! Seems like this poster named "Bob" used exactly the same name as me. I'm not here to point fingers at anyoen, just want to clear things up. I am in no relation to the other user named "Bob", just so you know that I'm not double-posting. My full name is Bob Fowler. I hope this can sort things out, if there should be any problems. I'm not in this to win, since I already have the application. But, at present I can't seem to get Facebook notifications. I don't understand why it's not working for me. Boxcar looks exciting. I'd be very pleased to be among the winners. I'd love to try this app. I was just reading about Boxcar, would be cool to try it out. This sounds great! I really need a push app for twitter. Looks like a solid app !! Haven't used push yet so this would definitely be cool to have. I'm sure I posted a comment yesterday but don't see it …. so will post again, if I double posted please ignore the one. I really need it, after getting Tweetie 2 (begged my mum like mad) I was uber disappointed that it did not have push notifications. Thus, i really really need Boxcar. Fingers crossed for a code! awesome, thanks for the chance at winning!